There’s a reason this one is first on the list and that’s because it was my absolute favourite!! In fact, it was so good that I went twice. Thank goodness I did because this place has so much detail that you’re bound to miss many hidden secrets. 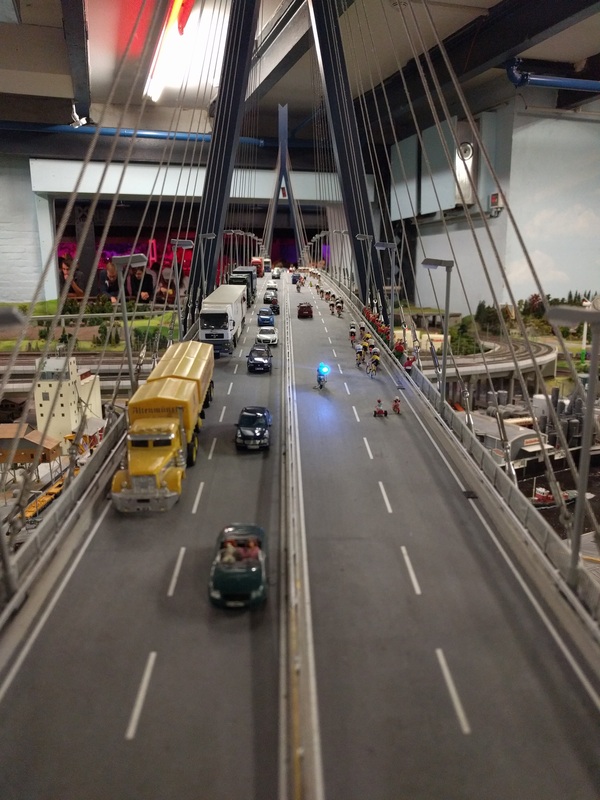 Miniatur Wunderland is one of Germany’s biggest attractions. 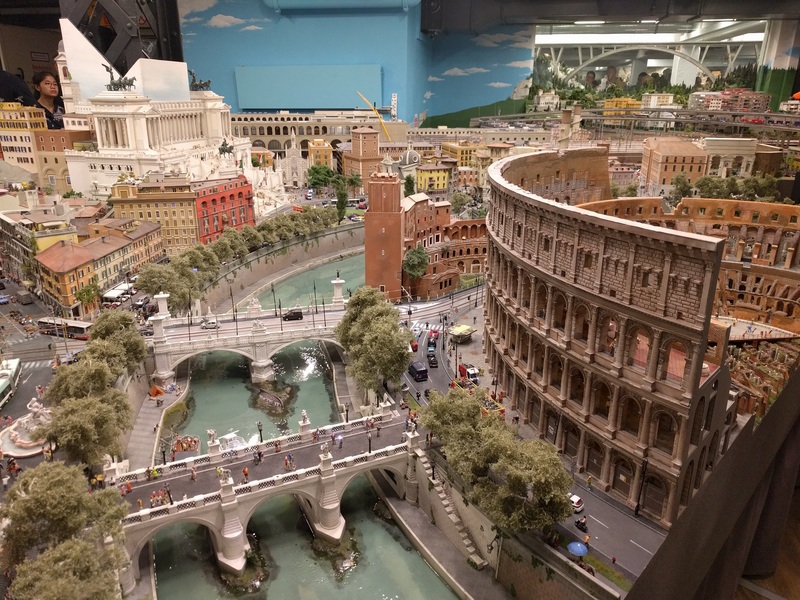 This amazing exhibition includes model replicas of Italian cities, Swiss alps, Scandinavian landscapes, American attractions and of course, the city of Hamburg. The detail within these displays is unbelievable!! Immaculate! I can only imagine how long it must have taken to create. From cars with flashing lights, to music festivals and carnivals, with personalised characters in every scene, working cranes, exploding volcanoes, elevated hot air balloons and floating cruise ships. It even has its very own tiny chocolate factory which spills out miniature chocolate bars on request. And if you pay close enough attention, you’ll find many hidden secrets such as Superman saving a falling car, a family of penguins patiently waiting at the train station or E.T flying in his bike basket. 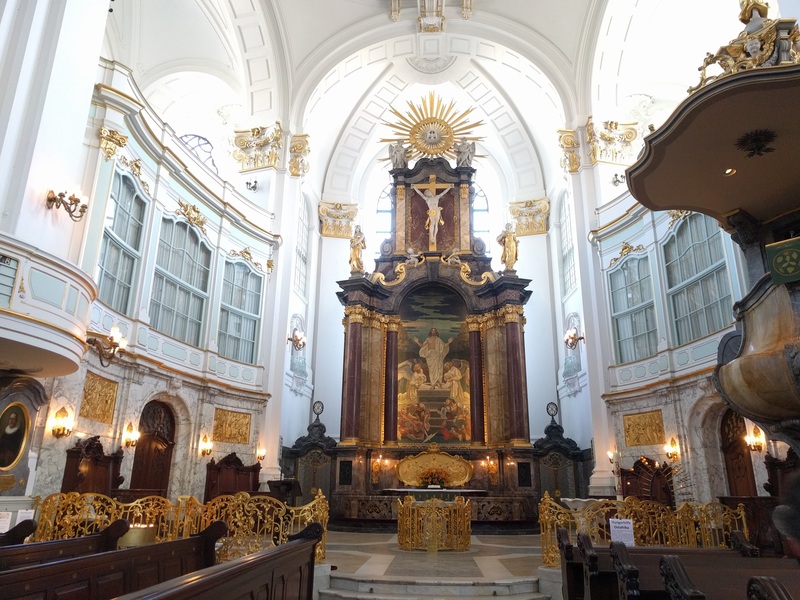 As you know, I love visiting a good Church and St Michaelis was no exception. As you walk through its marvelous doors, you’re greeted with pristine white walls and shiny gold detailing. The circular seating arrangement leads me to imagine a sense of community and involvement for all those who attend. The gigantic golden organ completely covers the back wall! And for the grand finale, if you spend an extra 5 euro you can climb inside the bell tower to be welcomed by 360 degree views of Hamburg. Hot tip! Arrive at the top just before the hour and you’ll get to enjoy the delightful sounds of the church bells. 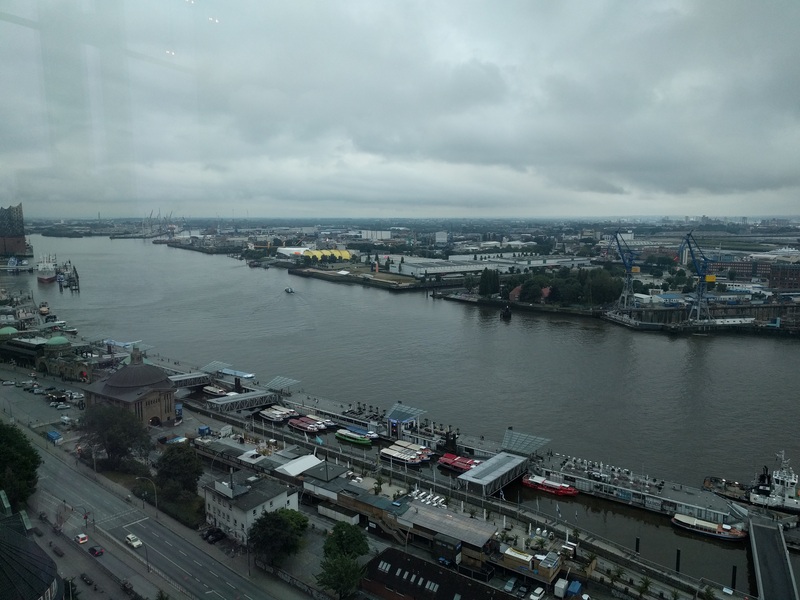 Want glorious views of Hamburg but don’t have time to wait for the weather to clear up? Then 20 Up Bar is your answer! As the name suggests, this bar is surrounded by glass walls 20 floors above ground. The cocktails may not be cheap but the view is worth it and you’ll stay dry! And for my male readers, then you’ll want to visit just for the kicks of using a urinal as you look out over the city. Sorry ladies – just standard toilets for us! 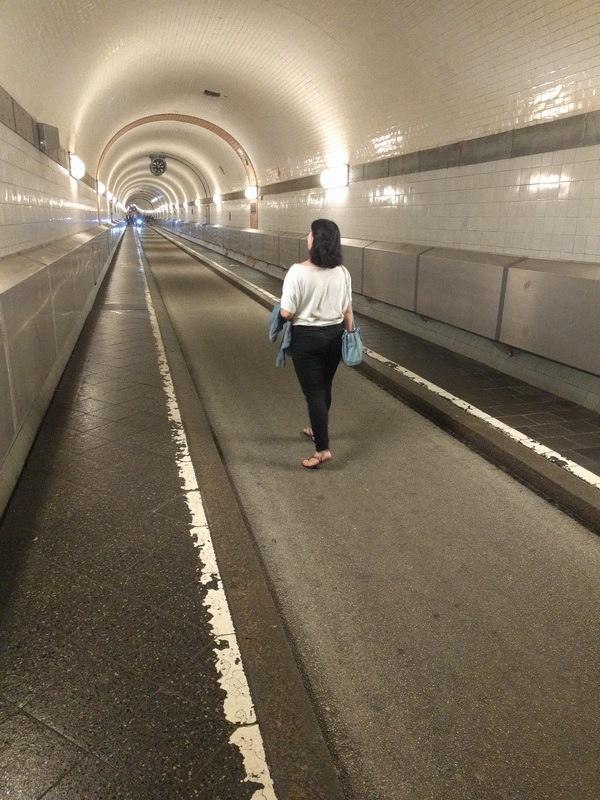 The St Pauli Elbtunnel is the oldest underground passageway in Germany. Originally built to encourage efficiency for people working on the docks, the tunnel is now used as a pedestrian walkway to cross the water. As you reach the entrance you’re greeted by a yellowy glow, as the warm light reflects off the cream walls. The domed tunnel stretched beyond sight. As I watched pedstrians and cyclists pass, I tried to imagine how they would have looked over one hundred years ago. There was just something about these walls that made you feel as though you’d been transported through time. What clothes would they be wearing? Would they be rushing to work instead of causally strolling in awe? And then when you finally reach the other side, there’s the benefit of looking back at the beautiful city of Hamburg; the perfect backdrop as we reminisced on the highlights of our 4 weeks in Hamburg. Hahaha the reason I didn’t tell you that is because I didn’t have one! It would be a false recommendation if I suggested where to find the best one!